There can be no trip to Chicago without a deep dish pizza, even with Alinea and other great meals on the planner. Granted I put off the deep dish until the very last day, but for lunch before flying out I walked to a spot that is supposed to be classic deep dish pizza: Giordano's. For lunch they have an individual sized pizza so we decided to share two different stuffings. 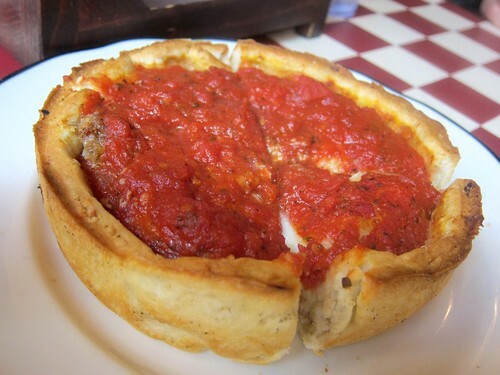 I have only had deep dish pizza at Little Star in San Francisco before and Giordano's is definitely "deeper". I've never had pizza so thick but this is certainly more fit to be called a pizza "pie" than any other. As you can see, it's not a topping, it's a stuffing, enclosed in more crust, then topped with tomato sauce. Good thing the buttery, slightly flaky crust is more like a pie crust. I personally preferred the sausage pizza. I'm a meat eater down to the core. You can take a whole pie home with you, frozen. Wrap it up well in a plastic bag and stuff it in your suitcase. They'll never know. 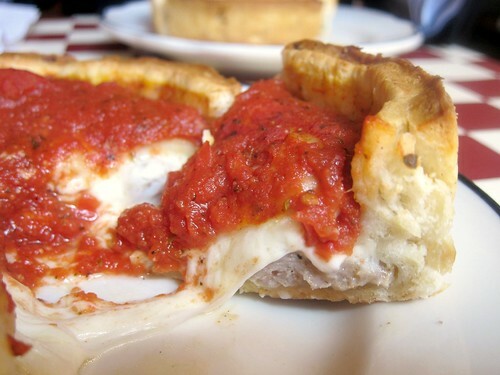 But the person you brought the frozen Giordano's stuffed spinach pizza back for will know. And she's mighty grateful. Mmm. I love these pizzas. So much good food in Chicago. So so jealous. 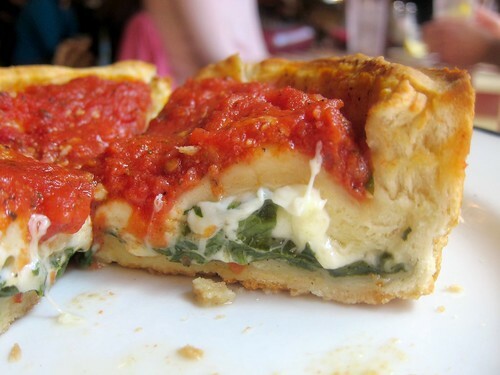 Giordano's spinach stuffed pie is one of the things I miss most about Chicago. Whoa, I'll take a slice of that spinach pie! 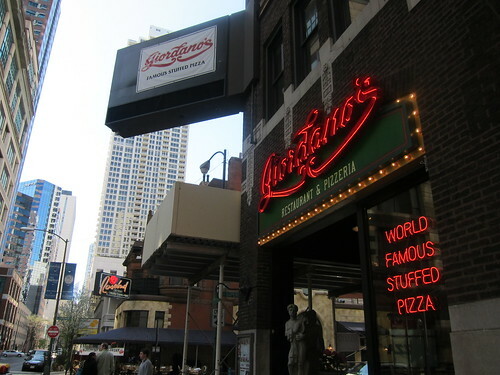 I've been dying for some deep dish. Next time I hope to try this! Gee, that is ultra-thick and tasty looking. I don't think I'd be able to finish one of those at all.